My trip to Paris was short but quite intense and during our stay of seven days we tried to visit as many attractions as possibile. We decided to take a tour guide to show us aroung the city which worked out great and we managed to see a lot of different sights. The only thing we had to miss out on was Versailles. 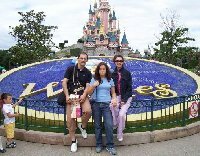 On our last day we had the choose between spending an afternoon at the Dineyland Paris park or visit the Castle of Versailles and the surrounding area. We decided to visit Versailles but unfortunately the castle was closed that monday so we ended up in Disneyland anyway which wasn't that big of a problem. Eventhough we had a great last day in Disneyland I do think most of the games and shows are more suited for the little ones and less exciting for the adults. Therefor the next time I visit Paris I will make sure to get to Versailles! Besides these two places Paris has a lot more to offer and we visited a lot of beautiful churches and monuments. The Eiffel Tower itself wasn't one of my favourites and it's really huge in real life. I also think that Paris has a lot of nice buildings and structures which are more unique and special. Did you enjoy Paris and Disneyland in one week and have you been on a holiday in Paris, France? Liked: A very fascinating, charming and beautiful city.